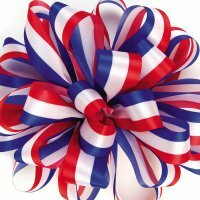 Offray's popular patriotic stripes are great for holiday bouquets, memorial and military wreaths. Show your true colors with this timeless print. The Ribbon Diva offers an array of Offray Ribbons that will make a perfect addition to floral arrangements, gift packaging and so much more. Widths: 9/16", 7/8" & 1 5/16"